Across the country, workers have been rallying for a $15 minimum wage, and for good reason. No one who works full time should live below the poverty line. Raising the minimum wage would lift millions of people out of poverty, inject billions of dollars into local economies and help low-income workers put food on the table and support their families. But there is a group of workers who make even less than the minimum wage, and they’re often left out of the national conversation about workers’ rights. Across the country, nearly 500,000 Americans with disabilities work for less than the minimum wage, many of them in factory-like settings known as sheltered workshops. They have been deprived of what most every other worker in America has received since 1938. Often working for pennies per hour, many of these workers can and want to pursue more rewarding careers at competitive wages in fully-integrated settings alongside their non-disabled peers. All they need is a chance, but some employers have a vested interest in keeping them exactly where they are: underpaid, overworked, and segregated from the rest of society. This fundamental unfairness is enabled by a Depression-era provision in the Fair Labor Standards Act that exempts these workshops from federal minimum wage requirements. Under Section 14 (c), the Department of Labor issues certificates to employers allowing them to pay workers less than the mandated minimum. Originally passed in part to encourage businesses to hire veterans after World War I, this provision is based on outdated and biased notions of what people with disabilities can do, and how much they can contribute. 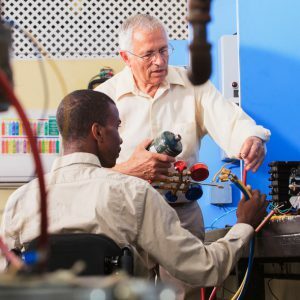 Employers are learning, and studies show, that people with disabilities have unique and valuable skills that can improve a company’s corporate culture and benefit its bottom line. Far from being a form of charity, hiring people with disabilities and paying them competitive wages is good business. At Walgreens, establishing an integrated employment model at its distribution centers helped the company achieve a 30 percent reduction in accidents and a 30 percent reduction in absenteeism. This is because the accommodations companies put in place for workers with disabilities end up benefiting all workers, helping everyone do their jobs more safely and effectively. There is now a growing national consensus that everyone, regardless of mental or physical disability, has something to contribute to the workplace, and deserves to be paid fairly for the work they do. Federal laws and court rulings are catching up to what employers have seen first-hand, recognizing that the exploitation and segregation of people with disabilities is unnecessary, wrong, and harmful to society at large. In Olmstead v. L.C., the U.S. Supreme Court ruled that unjustified segregation of people with disabilities constitutes discrimination in violation of the Americans with Disabilities Act. In Lane v. Brown / United States v. Oregon, a federal court made clear that this mandate applies to employment service systems for people with disabilities. Now Congress has an opportunity to support greater access, opportunity, and inclusion for people with disabilities. The Transitioning to Integrated and Meaningful Employment (TIME) Act would repeal the laws that trap people with disabilities in subminimum wage jobs and would help people with disabilities to transition to competitive integrated employment without losing access to valuable services. The private sector also has an opportunity to lead the way by encouraging the full inclusion of people with disabilities through accessible technology and robust diversity and inclusion efforts. Businesses need to hire people with disabilities as part of their mainstream workforces, and stop contracting with those sheltered workshops that employ harmful practices to segregate and exploit them. Federal contractors also have mandated goals to hire people with disabilities as seven percent of their workforce. Effective organizations are inclusive organizations, and fostering a more diverse and accessible work environment is a smart investment that yields big returns for the bottom line. Fifty-six million people in the U.S. have a disability. To tackle the challenges of the 21st century, we can’t afford to let 20 percent of our population languish in the shadows. We need their unique talents and tenacity to move our companies and our country forward. America’s economy works best when everyone is included and everyone has an equal opportunity to succeed. The public and private sectors both have a role to play and much to gain from including people with disabilities in the basic promise of the minimum wage and ending the unfair exploitation of people who can and want to earn competitive wages.